Antler v.s. Bone: A contest of context. We like to see things as black and white, good or bad, better and worse. It helps us function in daily life where we need to make fast judgements or live on cruise control without having to over analyze everything. But it is also a trap that can limit us and cause us to do really dumb stuff. It helps to look at things in context. We can pit antler against bone to see which one is better for tools and such, but the victor will be dependent on circumstance and what it is that we are trying to accomplish, rather than on more arbitrary grounds. Both Tamara and I have largely gravitated toward espousing and detailing the qualities of materials as a way to view paleotechnics. While our feeble minds may gravitate toward one or the other as superior, redwood is not oak, soapstone is not jade, antler is not bone, and none is superior to the other except in the context of specific uses. Bury an oak fencepost and it will probably fall over in 5 to 10 years, where redwood may last for 50 or much more. Make a bow out of redwood heartwood, but in spite of your best design efforts, it’s just going to be kind of lame. 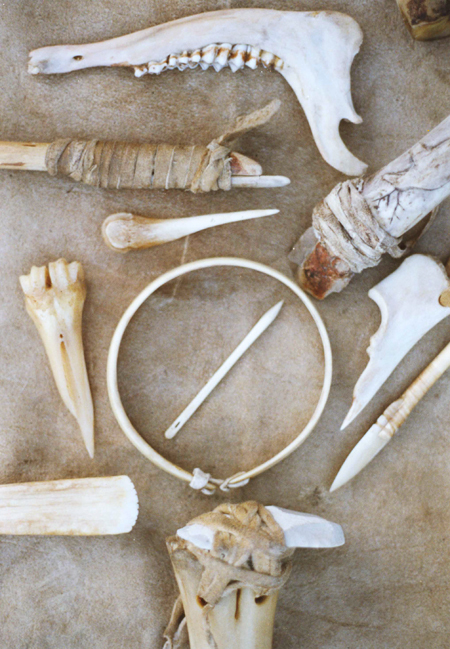 Some bone and antler objects. The hoop in the center is a choker made of an elk antler section thinned by scraping with stone flakes. It would not stay round because one end was from near the base where the antler is much more dense. After thinning and boiling repeatedly, it finally lost it’s flexibility and broke, probably from loss of collagen. Too bad, it was a really cool and a lot of work. But then, you get to learn from my mistakes, which makes me happy. Lessons learned, cut an item like this from antler of uniform character and don’t boil antler too much. Bottom is a bone handle for a dry hide scraper of chert would be better differently shaped of elk antler. Top right is a handle for a stone scraper with relief carving. top left, is an antler pressure stone flaking tool bound to a wooden handle. middle right, an ulna bone awl and a bone arrowhead hafted to a wooden shaft. All of these items are made with primitive processes.